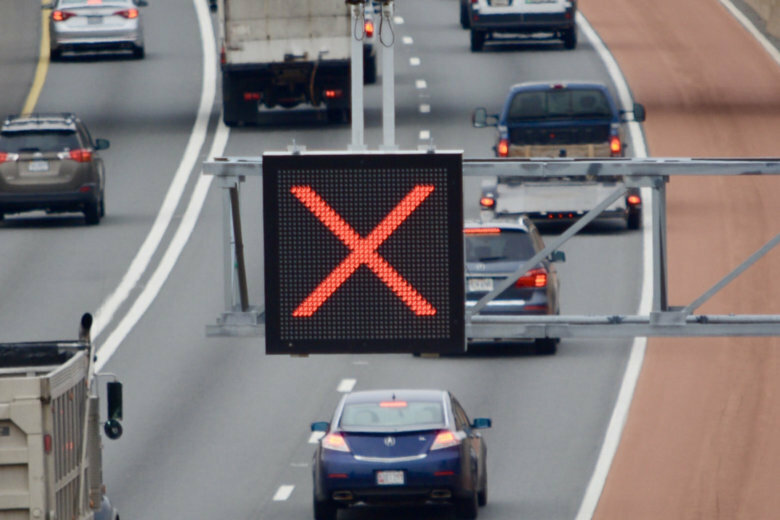 The "red x" or green arrow that can open up an extra lane to traffic on Interstate 66 will switch off for the final time Friday night between Virginia Route 123 and the Capital Beltway. WASHINGTON — The “red x” or green arrow that can open up an extra lane to traffic on Interstate 66 will switch off for the final time Friday night between Virginia Route 123 and the Capital Beltway. Much of the Active Traffic Management system that has helped boost speeds outside of rush hour by opening the additional lane through Fairfax County is being turned off less than three years after the $39 million system was activated. A sign on westbound I-66 near Virginia Route 28 will remain in place to mark the dedicated exit lane to Route 28 during the morning rush until construction reaches that area in the coming months, and portions of the technology upgrades included in the system will remain useful. The overhead signs and related technology that are being eliminated are making way for four years of major construction to build two HOV or toll lanes in each direction between the Beltway and Gainesville, Virginia. Those lanes will run next to three regular lanes and a permanent shoulder. The “red x” lane that has served as a shoulder at times it was not open to traffic will not return at the end of construction. For now, the road will revert to the old situation with the fourth lane (no longer painted red) open during rush hour. While it may sometimes be open at other times, construction crews will increasingly close the lane outside of rush hour as part of work zones. Those closures outside of rush hour and related slowdowns may be the most significant traffic impact of the loss of the lane control signage, since drivers have gotten used to using the “red x” lane most of the day amid regular I-66 backups. Construction crews plan to work in multiple segments of the entire 22.5-mile toll lane stretch at once for the next four years. For the last few months, crews have focused on setting up work zones by shifting lanes along the corridor with concrete barriers and new paint on the road. Crews have also picked up the pace this summer on clearing land and cutting down trees both for the road and a new park-and-ride lot in Gainesville. More work zones will be set up over the next few weeks, including on I-66 between Route 28 and U.S. Route 50. In Gainesville, the first part of a new University Boulevard park-and-ride lot is scheduled to open next summer. HOV rules remain in effect for the regular HOV lane on I-66 outside the Beltway. Also this weekend, major lane closures are planned on Interstate 395. The closures from late Friday night through Sunday afternoon for bridge work between Springfield and the D.C. line are planned to return each of the next six weekends. Part of the work is tied to the conversion of the 395 HOV lanes into HOV or toll lanes, due to open in late 2019.